Next week is my big week. I will be heading off to college. It seems as if yesterday was the day that I step foot into the lobby of my old high school, with a cup of Starbucks in my hand, ready to tackle what four years of high school had in store for me. It seems as if yesterday was the day that I was walked across a warm football field surrounded by thousands of people, ready to accept my high school diploma and see my friends for the last time on that very field. It feels like all of this happened within the past few days, but it didn’t, I constantly think about my last hugs, last fist-pounds, and last words with my friends from class. Now that I look back at high school, I can now say that it wasn’t as bad as I thought it was. Sure, it had it’s ups and downs, and sure- it kept me up until 2AM because I was probably finishing homework for Anatomy and writing last-minute essays for English, but I did meet some awesome people during those four years of my life. I met people who I could spend all the time in the world with, and I met people that I could talk to all day long- and they’d listen. Those four years of my life were the best and the worst years, but out of all of it- I learned that even though you mess up once, you hopefully won’t make the same mistake twice. I also learned that I can tackle just about any difficult project thrown at me, just as long as I have the right state of mind to complete it successfully. 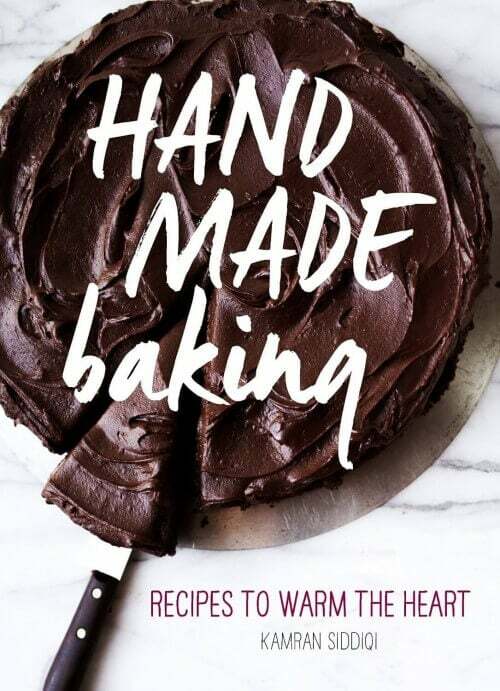 I guess you can say that I have applied that philosophy (or whatever you’d like to call it) to my baking- I am now fearless in the kitchen, and I’d like to share my fearlessness with you. So, today dear readers- I am going to put you onto the right road of kitchen fearlessness with a quick puff pastry recipe. A little farther on this road is classic puff pastry (which is definitely worth the effort- trust me! ), but we’ll start off with something a bit simpler, and it’ll leave you with flawless results! Making puff pastry is perhaps a fear of many home bakers around the globe, especially during the summer months, but come on- we’re now walking on a fearless road, so take my hand and I’ll guide you to making some awesome quick puff pastry that is just as great (if not- better) than classic puff pastry. When making this quick puff pastry (and any puff pastry- for that matter), you want to make sure that everything is cold. So, once you combine the salt and all-purpose flour into a bowl, and you cut the butter into ⅓-inch cubes (and place it into a separate bowl), chill the bowl of flour and salt, and the bowl of butter in the freezer for 10-15 minutes. Trust me, your freezer is your friend! Then, separate the chunks of butter with your fingertips- work quickly, and place it in the bowl of flour. 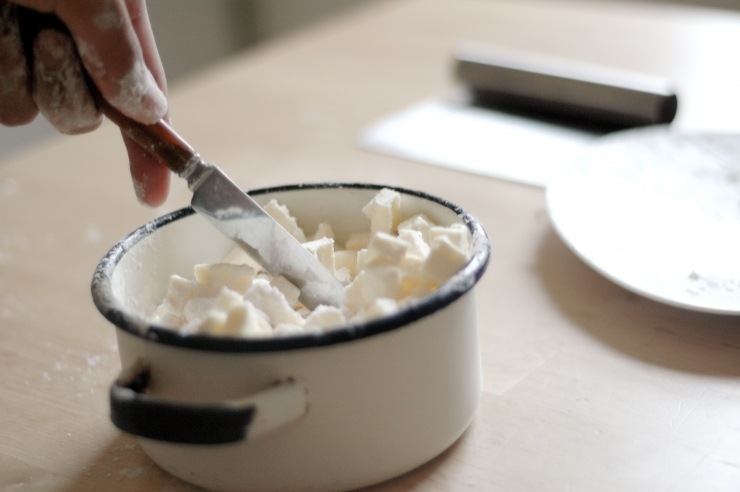 Once all of the butter is in the bowl with the flour and salt, take a butter knife and coat the butter with the flour, and throw in a little chopping action! Not too much chopping, just so every piece of butter is coated. Now, drop the contents of your bowl onto your work surface. Preferably a marble board or metal counter (you can even use a chilled baking sheet), but if you’re as fearless (doesn’t sound better than cheap?) as I am, and don’t have a marble board (I promise to pick one up soon! 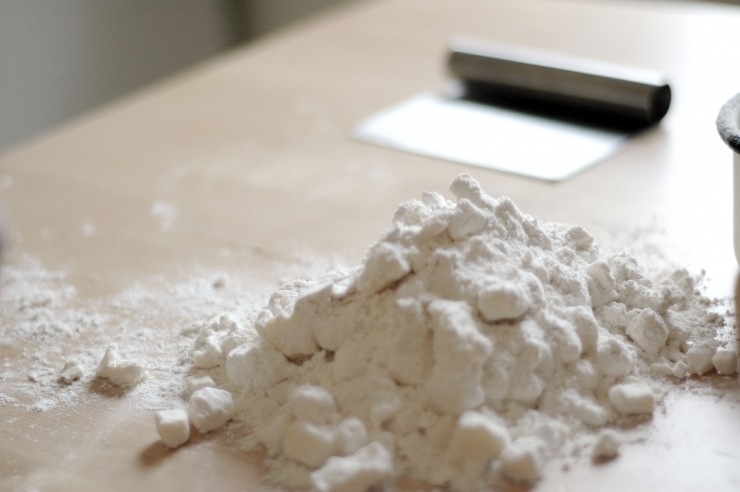 ), use whatever clean work surface you have. 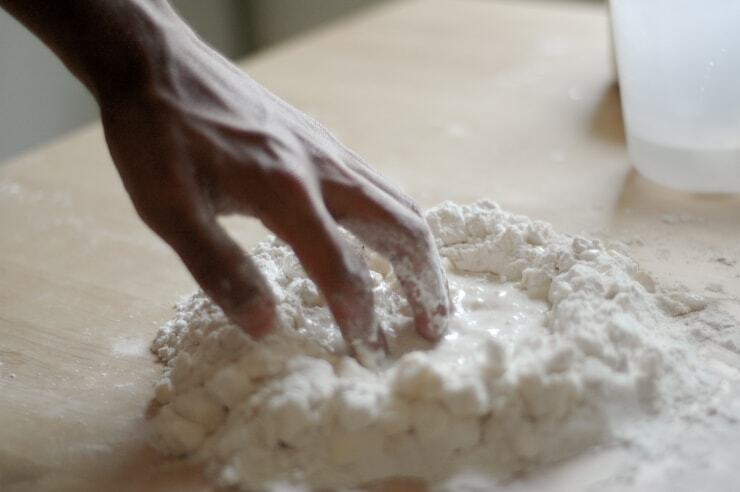 Just keep in mind you’ll need a lot of flour and you will need to work very quickly. 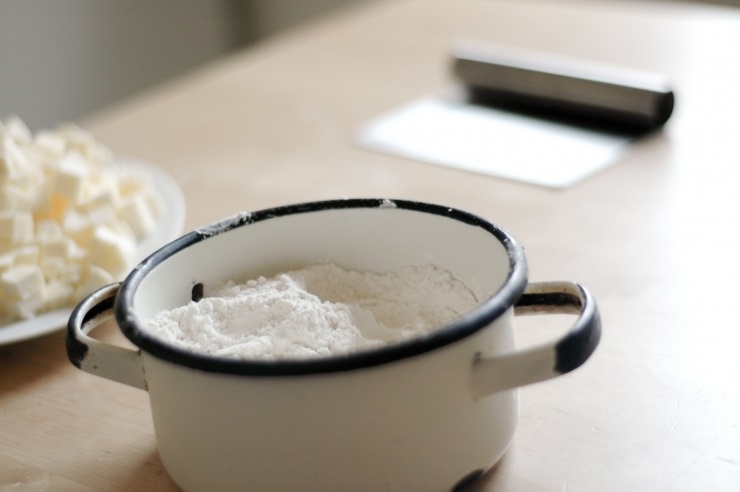 Form the pile of flour and butter into a well. Pour in a few tablespoons of the ice water at first. Mix with your fingertips. 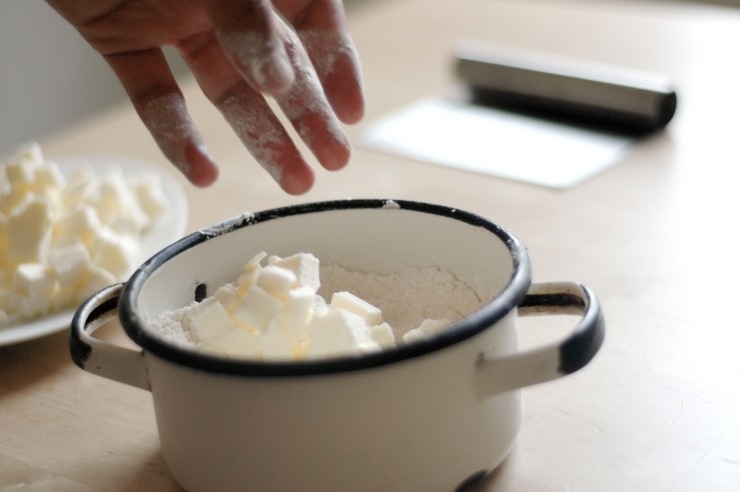 You can test the mixture by gently squeezing a small handful. When it has the proper texture, it will hold together without crumbling apart. Knead the dough for 30 seconds. 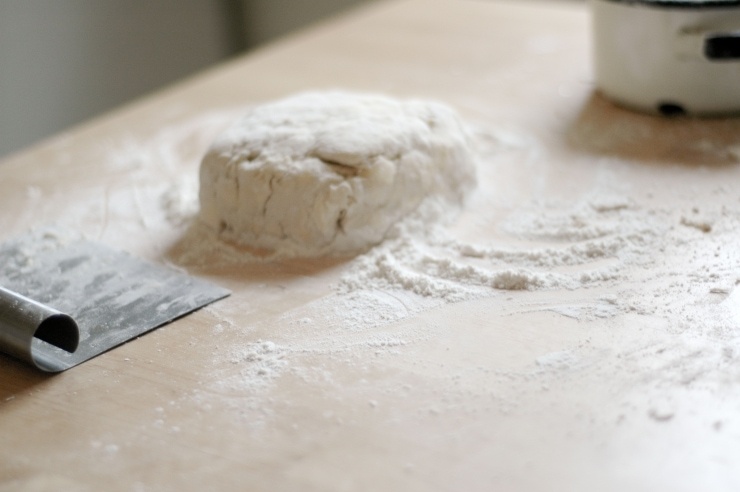 Form the dough into a square. This is when you may want to wrap the square of dough in plastic wrap, and place it in the refrigerator for about ½ hour (until firm), but depending on how hot and humid it is in your kitchen, you may not need to. 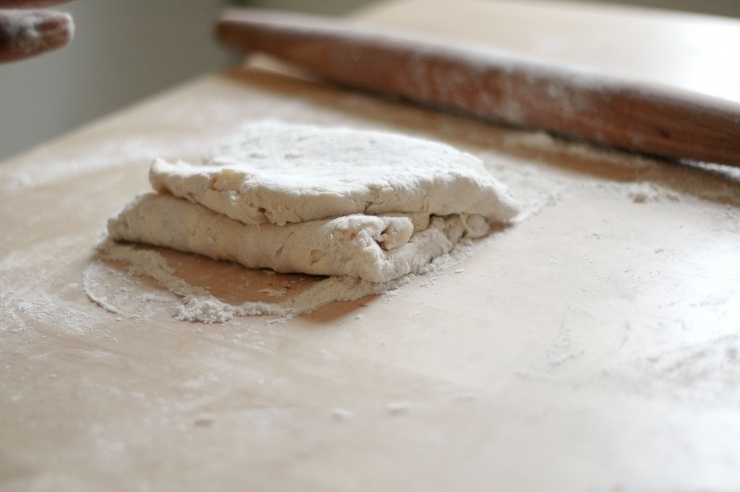 After the dough is formed into a square, roll it out into a 15-by-8-inch rectangle. Fold the short ends over the middle (like a letter) to make three layers. This is the first turn. 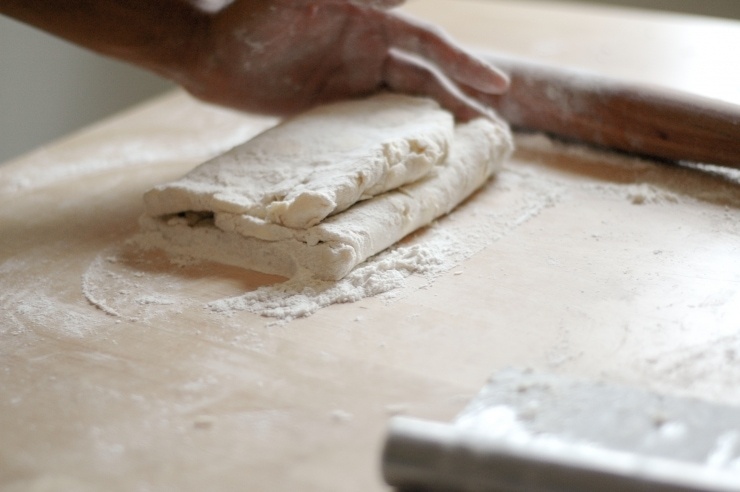 Repeat the process for the steps of folding (and giving the dough ¼ turns) to create the third and fourth turns. Wrap the dough in plastic wrap. Refrigerate for at least 30 minutes before use (or up to 3 days). And you’re done! See how easy that was? Now, keep in mind that the dough keeps well in the freezer for up to about three months, but with all of the baking I do around here- it doesn’t even last a couple days! Having a digital kitchen scale is so much easier than having to actually measure everything out with this, so if you don’t have a scale- I’d go out and get one, unless you want to wash tons of dishes after you make this quick puff pastry. Mix salt and flour and place in a bowl. Cut butter into ⅓-inch cubes, place in a bowl. Chill bowls of flour and butter for 10 – 15 minutes in the freezer. 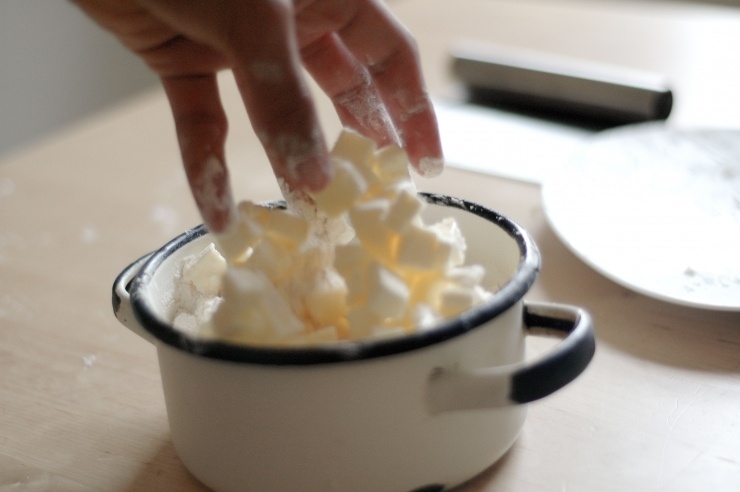 Separate the chunks of butter with your fingertips- work quickly, and place it in the bowl of flour. Dump the contents of your bowl onto your work surface. Preferably a marble board or metal counter (you can even use a chilled baking sheet), but use whatever clean work surface you have. 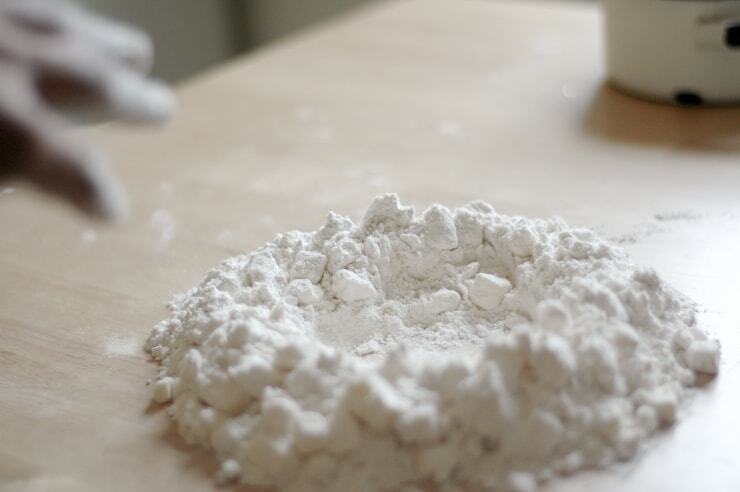 Just keep in mind you’ll need a lot of flour and you will need to work very quickly. 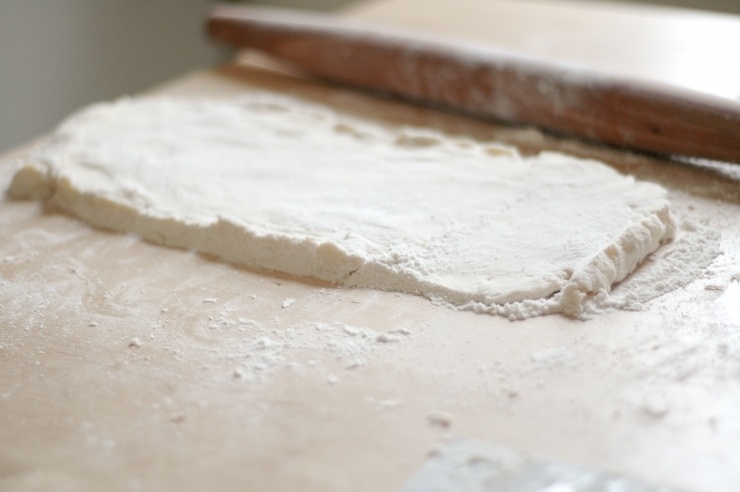 After the dough is formed into a square, roll it out into a 15-by-8-inch rectangle. Fold the short ends over the middle (like a letter) to make three layers. This is the first turn. Thank you for this ~ beautiful pictures and a very clear explanation. Nicely done! Puff Pastry is easily one of the favorites in my home. I don’t make it though because it is not as easy as you make it sound. I love stuffing it with curried veggies or lentils and surprising even my kids love it. Ah yes, high school. All these years later and I still have mixed feelings about it. Love love your photos, and I’ll definitely try out this recipe. I was just reading about a pizza made with puff pastry. I would think it would get too soggy, but I must say, I’m very curious. My puff pastry has totally different steps. 4. Head home, let it thaw and tada…you’re ready to go! This looks much better and ONLY something I would consider for the holidays…but guessing I should make a couple at a time and freeze; even use that precious food saver machine I actually own! This is a beautiful post and the photos are stunning. Well done! You seriously rock. I can’t believe all you do, and just heading off to college! You have your whole life ahead. Enjoy. Good luck! I love the step-by-step photos. I think with something as challenging as puff pastry, you totally need them! My dad is the king of puff pastry–he makes it every Christmas. Congrats on going to college. Wish you all the best! Great job on the site, it looks wonderful. I am going to bookmark it and will make sure to check it often! If only the Top Chef DC contestants were doing this. Why do they keep buying frozen pastry dough when it is so simple? Fabulous! I have never made my own. And I’m not much older than you, but it feels like forever ago when I went to college. I remember it perfectly. Enjoy! Kamran, puff pastry is my most favorite dough. So simple with just a few ingredients, but the end result is so rich and wonderful. Making it is almost more satisfying than eating it, too. Beautiful post, but I’ve come to expect nothing less from you. I am MUCH older than you, and I remember my first days at college like they happened yesterday. Enjoy the experience. Remember, it’s more than just about the books. Kamran, you are fearless. And your post makes me think that even I could stumble my way to homemade puff pastry. Best of luck with college! I bet you’re going to love it! It is absolutely 100% nothing like high school, in an amazingly good way. I’ve never seen puff pastry made this way, interesting. I just finished college, will be off to University in a while, I’m having the same jitters! I’ve never attempted Puff Pastry before. Love your steps-by-steps pictures and instructions. I’ll have to try. What are you taking in College? Great puff pastry tutorial. And good luck in college. Wonderful tutorial – and I think I may just be brave enough to give this a try! :0) Best of luck in college – it’s my prediction you will find much success there!!! Thank you everyone for the best wishes in college! so excited for you! wish i could go back in time and relive those weeks leading up to college all over again. enjoy every moment! your puff pastry looks beautiful! I like your recipe for puff pastry… Much better cutting the butter in the flour than trying to pound out the giant butter cube like I usually do (although I’m sure that’s much more entertaining, watching me try to pound a giant cube of butter with my rolling pin… Glad there were no cameras!). I’ll definitely give this a try. Best of luck with your college adventures… I’m sure you’ll do great things and have a wonderful time! Kamran I have no doubt that you will approach college with the same fierce, tenacity that you have shown with this puff pastry and this blog! true. i freak out every time someone asked me to make puff pastry. great pictures! ps : high school is the best! college is great too thou. hope u have a great time @ college! What a week you have coming up, Kamran! I wish you all the luck as you settle into your life at college. This puff pastry is definitely on my to-try list. I use puff pastry a lot, but have never got up the guts to make it myself. I love making rough puff pastry, I also like doing the regular depending on the application. Good luck with college! Kamran, WOW! That’s all I have to say. You are very amazing and I am definitely joining you on your road to kitchen fearlessness! I made your rough puff pastry today after doing a search on Google for quick puff pastry and I absolutely loved the results!! Maybe a little less “puffier” than classic puff pastry- but just as amazing, if not better! Wishing you all the best on your journey, now starts another stage in your life and I am sure you will do amazing and learn so much about yourself. Enjoy college and I cannot wait to see more delicious recipes and beautiful photos from you! Well, I simply know that college will be great. I want to hear all about your first few days, and I hope you enjoy it! This puff pastry looks fantastic. I really must try it again. Maybe when my parents can have dairy again :). High School – I have such mixed emotions about the whole ordeal. My 25 year reunion is coming up this fall; but, I will not make it for many reasons, one of them being, that I will be working a project in Detroit. Funny, as sometimes, even though, I am definitely in my adult years, I still feel like life can be like high school. Do people really grow up? Best of luck to you! College will be one of the most amazing and most memorable time of your life. Absolutely stunning photographs!!! How goes it, College Fella? I know I’m keeping up with you on Twitter for your educational escapades, but hope you know we’re all cheering for you and glad to see you’re being as voracious with education as you are with food. Best of luck with this new chapter in your life- you are sure tomake it a success! And congrats on the puff pastry- when I made my own croissants, my kitchen looked like a flour bag exploded!! Everyone– thank you so much for your kind words and wishes of luck. college has been going well, so far! Great recipe. 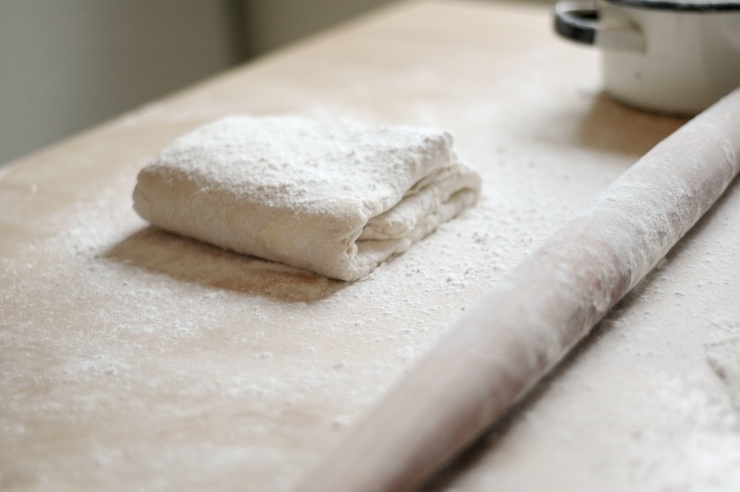 You’re right – you did take the fear out of making puff pastry. In fact, it looks like fun. Hope college is a terrific experience for you. What is your degree? Ohh that’s awesome! But the real question is, what will you make with the puff pastry! I recently came by your blog, and I’m absolutely loving it! The photos, the easy recipes are fun to read, and I think your blog will soon become one of my favorites. This puff pastry recipe is so good to be true. I’ve always wanted to make puff pastry, but since I’m impatient and a bit messy, I couldn’t dare to do it. This looks much more easier than making real puff pastry. But I have a question, will it also look like real puff pastry? I mean, will it be layered and “puffy” when baked? If so, then I’ll definitely try it, make some napoleons with them and post it to my blog referring to you! Great post Kamran. Love the step by step photos. I want to be fearless in the kitchen too. Thank you! This is great to have as a guide. I can’t tell you how many recipes I’m excited to try, until I get to the recipe and it calls for two packages of puff pastry. I much rather make my own, so thanks! Thanks so much. I tried out your recipe and for a first attempt I think it went quite well. I’ve been looking for a very basic puff pastry recipe for months. I cannot bring myself to use frozen dough. I refuse to. Definitely going to try this out soon – thanks for sharing! I made this and it was so easy and turned out great. Thanks for the recipe! 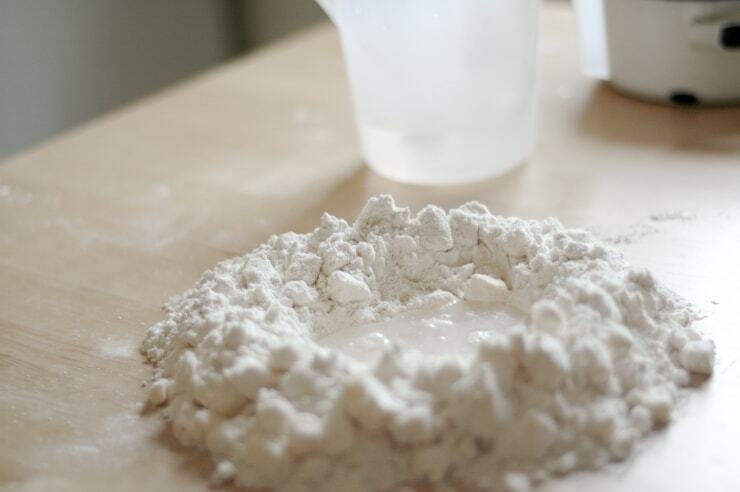 Put in flour and pulsed until mixed just mixed. Put a bag of ice on my granite counter before all of this and let is chill the rock. Then shaped rolled and folded 4 times fast since everything was very cold and … I’ll have to let you know that where I am … But it looks and feels perfect and I can have pasty in a flash if it works. Most of these people reviewing haven’t even tried the recipe. Does it puff? I love the step by step procedures but you should post pictures of the finished result! How much puff pastry does it make? Hi. I just found your site. I love that you posted pictures. I can finally understand how to make it. However, I have one question, if I want to make it dairy free, what should I use instead of butter? Should I use oil or vegan shortening/margarine? Thanks. I also tried to make puff pastry same method but mine did not rise at all. I just used this pastry recipe to make some danishes, they turned out fantastic! Thank you for the wonderful recipe. Based on the amount of ingredients used I would say it makes two sheets of pastry. I have not tried this recipe yet but is is very close to another I have made that makes two sheets.